Have you ever wondered how the Sun would look from the other planets in our solar system? Here is a visual showing the apparent size of the Sun from the planets of the solar system, including Earth. 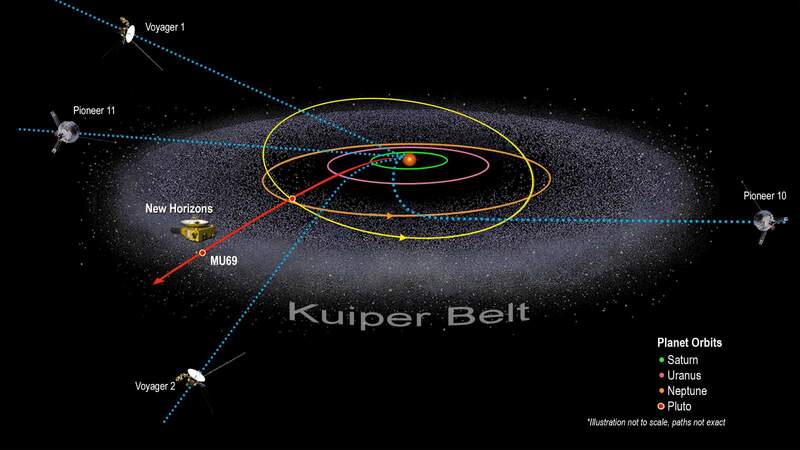 In December 2018, astronomers discovered the farthest known object in our solar system, which is about 120 times farther than Earth is from the Sun (120 Astronomical Units -AU) and named it “Farout” (far-out-there). But its record didn’t last long. Now, while searching for the hypothetical Planet X, Scott Sheppard, an astronomer at the Carnegie Institution for Science in Washington, D.C. has found what might be the most distant object ever identified in the Solar System. It orbits the Sun at a massive distance of 140 Astronomical Units (AU), and for now, the astronomers are jokingly calling the new object “FarFarOut”. As of 2019, only five space probes are leaving the solar system: Pioneer 10, Pioneer 11, Voyager 1, Voyager 2 and New Horizons. The Voyagers already left the solar system and entered the interstellar space (Voyager 1 on August 25, 2012, and Voyager 2 on November 5, 2018. The others also will leave the heliosphere Notes 1 and reach the interstellar space in a few years. All of these spacecraft are launched by NASA. Watch: How far can Voyager 1 go before we lose contact? Launched by NASA on September 5, 1977, to study the outer solar system, the Voyager 1 is the furthest human-made object from Earth. As of January 10, 2019, the space probe is more than 13,491,481,615 miles (21,712,434,988 km) away from our home planet. It is also moving away at a speed of 38,026.77 mph (61,198.15 km/h) relative to the Sun. But, thanks to NASA’s Deep Space Network (DSN) Notes 1, we can still communicate with it (also with its sister, Voyager 2). But how far can Voyager 1 go before we lose communication? The video published by the Primal Space channel below looks at how we communicate with Voyager and when it will eventually stop receiving our signals. A beautiful Ultima Thule image, taken by the Long Range Reconnaissance Imager (LORRI) aboard NASA’s New Horizons spacecraft in original context against a starry background (i.e., not zoomed in). NASA Goddard Planetary Scientist James O’ Donoghue created a nice animation showing the sidereal days and axial tilts of the solar system planets.